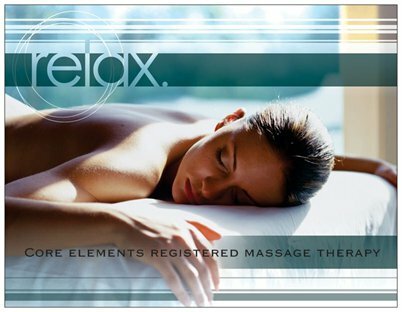 Your Core Elements team in Orleans are Registered Massage Therapists who excel at providing therapeutic and relaxation massages. If you are like us, chances are very good someone close to you is suffering from everyday life stresses or possibly injuries that would benefit from therapies we can provide. To give the gift of relaxation or to help improve the overall well-being of someone you care about, we offer a massage gift certificate. Finding the perfect gift can be a challenge but we have made it simple for you. 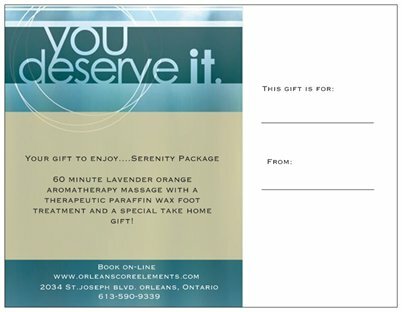 Available to purchase by phone, email or in person, a massage gift certificate from Core Elements in Orleans is perfect for gift giving. Whether it’s a deep tissue massage, a prenatal massage or a massage just because, your recipient will be sure to cherish your gift of improved health. To purchase a gift certificate email us at info@orleanscoreelements.com or call us at 613-590-9339 and we would be happy to help you find the perfect gift! Can’t make it in to pick up your gift certificate? We offer the convenience of emailing the gift certificate to you or the recipient.